Is this rhino still alive? This is the exact picture that hangs in my living room. Other African animal 8x10's surround it; all glossy, protected and framed. They're remnants of my first trip to Africa. I often look up at this particular picture and wonder, "Is this rhino still alive?" My curiosity was intensified even more when I came across an article via Nat Geo on twitter titled "Good News for Animals in Nepal: A Full Year Without Poaching." It was fantastic news for Nepal and the global community against poaching. Although sadly among the great news, it reminded its readers of the poaching crisis elsewhere. Kenya recently lost four rhinos in the short span of a week; three in Lake Nakuru National Park and one in the Masai Mara. This really hit home. I've been to both parks and have had the incredible opportunity of seeing rhinos in the wild. At the time it never even crossed my mind that these particular rhinos were in just as much danger as any that walk the African continent. I surely thought that a rhino living in a national park with all the guards and anti-poaching units were safe. (Lake Nakuru National Park is even fenced!) Was I ever wrong. Hundreds of rhinos each year are killed for their horns due to the rise in the Asian Medicine Market. In Asian culture they grind the horn to remedy a variety of different symptoms; from nosebleeds to fevers. What is so shocking about this is there is absolutely NO SCIENTIFIC PROOF that rhino horn cures any of these symptoms! Organized poaching gangs now use advanced technology like night vision goggles, silencers, and even helicopters to hunt the rhinos. The demand for their horn is just too relentless. With less than 5,000 left in the wild, the future for Black Rhinos seems uncertain. Although there is hope. Conservation organizations are working hard to fund anti-poaching units and rangers. Social media has also become a great tool to help spread the word about the poaching crisis. You can help by donating to these conservation organizations, spreading the word about the plight of rhinos, and never buying rhino horn related products. I'll never forget the first time I saw this wild rhino. We were out on safari in the Masai Mara photographing giraffes when suddenly our driver James started frantically saying "Sit down, sit down, there's a rhino over there!" We all sat down as fast as we could, cameras and equipment flying everywhere, holding on tightly as James made his way over to a particular clearing where all I could see was a large, gray rock. 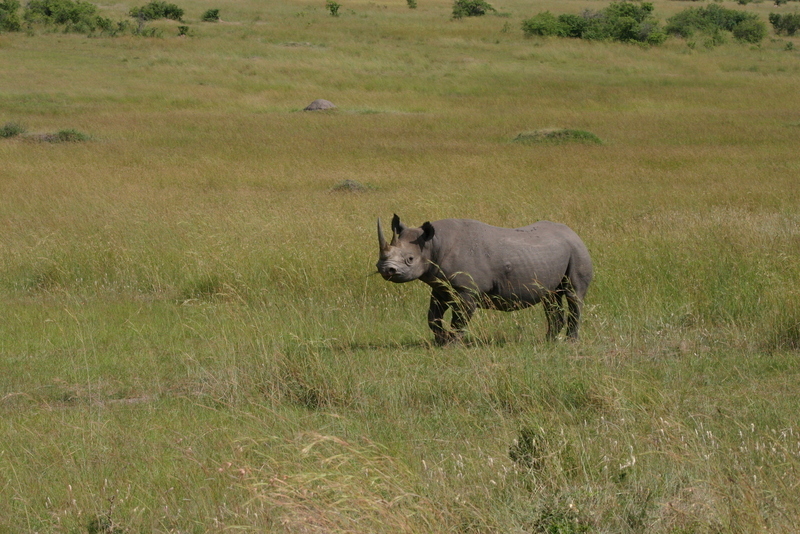 That gray rock turned out to be one of the only 25 Black Rhinos left in the Masai Mara! Words can't even describe the feeling of seeing one in the wild. The chances are slim-to-none, so to actually find one was incredible. I remember it turned towards us with an aggressive posture, its tail raised. Then after realizing we meant it no harm, it turned around and headed back into the thicket. Just as fast as it had appeared, the Black Rhino disappeared like a ghost into the African savanna. I sure would like to hope that this magnificent creature is still roaming around the Masai Mara, giving other observers the same opportunity I had. I couldn't imagine an Africa without Rhinos.